One of the concerns people have when downsizing to a small house, and especially a tiny one, is not having enough space to entertain family and friends. Since dinner parties are one of the most popular ways to entertain, celebrate, and socialize, finding a way to fulfill this need is important. Although there are several options for having a dinner party away from your home, an appealing and potentially delightful solution is to create an outdoor dining room. There are many ways to build such a space in your garden or yard. With some imagination, you can make it very attractive and unique. 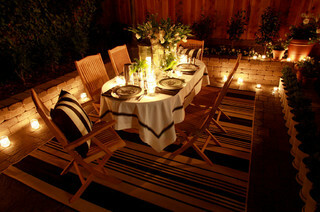 You may find that the ambiance you can create outdoors might surpass what you can do indoors. An outdoor dining room can be easily changed and enhanced by adding new plants and trees, landscaping features, an outdoor fireplace, or even a “small” outdoor kitchen. Moreover, it will evolve on its own as the plants and trees surrounding it grow bigger and change with the seasons. 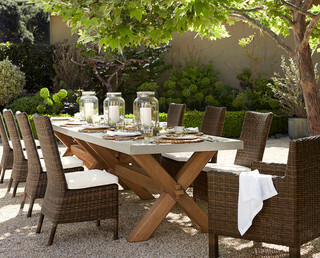 Enjoy the following photo tour of outdoor dining rooms. 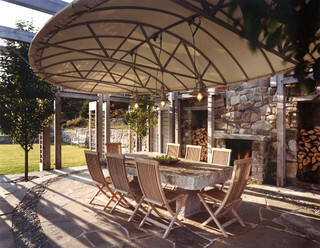 The stone fireplace and cover add to the elegance and practicality of this outdoor dining room. 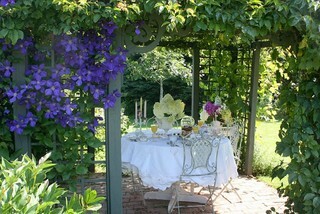 A pergola with vining plants is used here to create privacy, shade, and beauty for this outdoor dining room. Love those purple flowers. 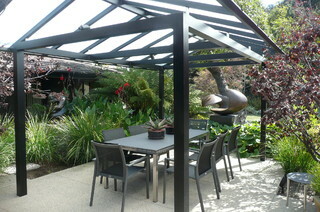 I hope you got some ideas and inspiration from these outdoor dining rooms.